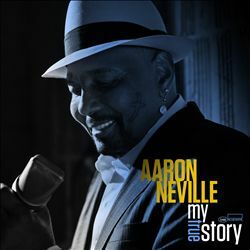 After close to thirty years (since I first heard Orchid in the Storm and his work with the Neville Brothers) I’ve come to the reluctant conclusion we’re not going to get a classic Aaron Neville album, at least not one that matches a unique voice to the stellar collection of material that would set it off just right. That’s not to suggest there haven’t been great performances along the way, and if you were to grab any of Aaron’s recorded output (it’s a fairly extensive discography, as detailed here) you’ll almost certainly find something that sits comfortably on the continuum between sublime and outstanding. The problem is you won’t find an album where the contents (the whole contents, that is) sit there consistently. It might be out there, of course, but if it is I haven’t found or recognized it. And, in the meantime, My True Story will do until the real thing comes along. Part of the problem is a tendency for whoever sits in the producer’s chair to select a range of material that shows off that voice in a variety of settings. That's fine if it works, but these things don't always work quite as well as you might hope. Don Was and Keith Richards deftly avoid that problem here by restricting the range to doo wop, which as it turns out, was Neville’s first love. Glance at the track listing and you’ll recognize a couple you mightn’t associate with the style, but there’s no question about the nature of the treatment Money Honey, Be My Baby and Work with Me Annie receive here. The contents rock along gently with the vocals front and centre and the instrumental touches firmly in the background, filling out the spaces where the vocals don’t reach and padding out a sound that’s decidedly retro but still clear as a bell. Much of the credit for that has to go to the quartet of backing voices drawn from actual original doo-wop outfits like The Teenagers, the Del Vikings and, particularly, the Jive Five, who provide the album’s title track. There’s a deft touch of swing to the opening Money Honey, with Richards’ guitar prominent in the mix and operating in the less is more school, which is entirely appropriate here. The falsetto kicks in big time on My True Story, heavy on the heartbreak of an ill-fated romance with Eugene Pitt, who sang the Jive Five original, as one of the voices in the background. The crew sashays their way through Leiber and Stoller’s Ruby Baby at a pretty lively clip while things are slowed down for a smoky reading of Curtis Mayfield’s Gypsy Woman, a prime slice of Impressions’ Chicago soul given a doo wop slant. Ting a Ling, a Number One hit for The Clovers written by Ahmet Ertegun and covered by Buddy Holly, gets a suitably swinging reading. You might be inclined to slot the Jeff Barry/ Ellie Greenwich/ Phil Spector Be My Baby firmly into girl group Phil Spector Wall of Sound territory, but that’d be forgetting the role doo wop played in the development of that scene. Given how good things have been up to this point, with class oozing out of every selection you might think I’m stretching it when I reckon this is the highlight so far, but the interaction between Neville and the backing quartet is particularly fine here. And it’s almost as good on the lively take on Little Bitty Pretty One. The classic tracks continue through Neville’s take on Little Anthony and the Imperials' Tears on My Pillow and The Drifters’ Under the Boardwalk gets the old groove going perfectly before brother Art Neville turns up to sit in Hammond on B-3 for Hank Ballard’s Work with Me Annie. This Magic Moment segues seamlessly into True Love, with Goodnight My Love (Pleasant Dreams) winding up proceedings without, for once, the seemingly obligatory slew of bonus tracks. .
Cut live in the studio with a crackerjack band (Keith Richards and Greg Leisz on guitars, Benmont Tench on organ, Tony Scherr on bass, saxophonist Lenny Pickett and George Receli on drums) My True Story comes across as a genuine period piece, delivered clear as a bell thanks to advances in recording technology with the voices the way they should be and everything else as window dressing. A seemingly effortless recreation of a long bygone era, delivered with panache and best of all, there are at least a dozen other titles already in the can for a sequel, with Neville suggesting a likelihood of Doo-Wop parts 2, 3 and 4!